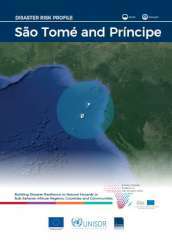 Today marks a major milestone in the implementation of the global plan to reduce disaster losses, the Sendai Framework for Disaster Risk Reduction, with the launch of the Sendai Monitor which allows UN Member States to commence reporting on the their progress in reducing disaster losses and increased efforts to manage disaster risk. Following a two-day meeting in Geneva this week, DRR partners are considering a proposal to establish a new UNISDR Stakeholder Advisory Group to support implementation of the Sendai Framework for Disaster Risk Reduction in coherence with the 2030 Agenda for Sustainable Development. Climate Risk and Early Warnings System (CREWS) hosted a session on lessons learned from the devastatiing effects of the 2017 hurricane season in the Caribbean. Early warning systems for the region are under review ahead of this year's season which starts on June 1. 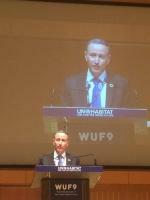 The opportunity to build back better is an opportunity not just to prevent loss of life but to restore a community's morale and to integrate disaster risk reduction measures into daily civil life, UNISDR head, Robert Glasser told a Special Session at the World Urban Forum yesterday. The print version of the Making Cities Resilient Campaign Handbook was launched today at the World Urban Forum following a discussion on urban risk featuring Quito and Kampala. UNISDR head, Robert Glasser, issues call at the World Urban Forum in Kuala Lumpur, Malaysia, for more cities and towns to join the Making Cities Resilient Campaign. How can we restore hope to the world's slum dwellers? The World Urban Forum opens this week in Kuala Lumpur, Malaysia. In this opinion piece, UNISDR head, Robert Glasser stresses the importance of local governments catering to the needs of low income groups when building resilience to disasters. The UN Secretary-General, António Guterres, has announced the appointment of Mami Mizutori of Japan as Assistant Secretary-General and Special Representative of the Secretary-General for Disaster Risk Reduction. Three Year Hot Streak "Existential Threat to Planet"
NEW DELHI, 15 January, 2018 - India’s Home Minister Mr. Rajnath Singh, today expressed India’s desire to lead a global coalition which will work towards reducing damage to critical infrastructure as called for by the Sendai Framework for Disaster Risk Reduction. A number of meetings and declarations in recent weeks have emphasized the importance of space technologies in supporting UN Member States to implement the Sendai Framework for Disaster Risk Reduction, the global plan to reduce disaster losses by 2030. UNISDR convened a meeting this week for experts to discuss integration of disaster risk into National Adaptation Plans being drawn up under the terms of the Paris Agreement on climate change. A two day meeting got underway today in Geneva to work on a Global Risk Assessment Framework in support of the Sendai Framework for Disaster Risk Reduction and the 2030 Agenda for Sustainable Development.